Ice cream is one of the worlds’ favorite comfort foods. It just seems to make everything better, don’t you agree? This vegan berry ice cream is smooth, rich, creamy, and fluffy. It’s also scoop-able and so easy to make. Many people don’t realize that the mouthwatering world of vegan ice cream even exists. There are so many flavors you can choose from and no, I am not talking about icy, flavorless frozen dairy substitutes. 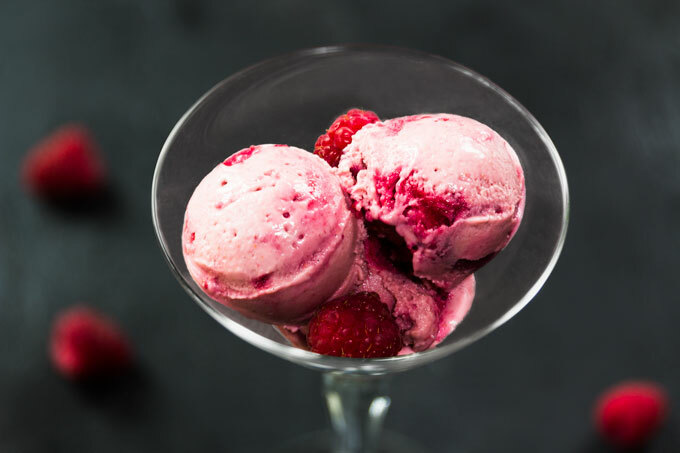 Vegan ice creams, including this vegan berry ice cream, can be as creamy and delicious as the real deal. The gold standard in vegan world for mimicking the mouth feel of dairy are full-fat coconut milk and coconut cream. Thick, creamy, and milk-like. The only caveat here is the flavor – coconut cream does impart coconut flavor to the ice cream. That’s not necessarily a bad thing if you’re making coconut ice cream or if you love coconut. But what if you want some different flavors, like vanilla, chocolate, berry? Or what if you don’t like coconut? The base for this vegan berry ice cream is made from cashews. Cashews provide a faint richness without any overpowering flavor. This means that they’re easy to mask and you would never guess that there is no cream. As Jennifer Newman shared in one of her interview, “the consistency is really rich and creamy and I would put it up there with with Häagen-Dazs”. Another ingredient that gives ice cream its creamy and smooth texture is oil (in this case, I used coconut oil). Coconut oil is has an advantage over other fats in that it slows down the melting of ice cream. Since I didn’t want my ice cream to taste like coconut, I used a very tiny amount, which is all you need. The flavoring comes naturally, from whole fruit, in this case strawberries and raspberries. However, you could you use any berries you like. I was actually thinking of making triple berry ice cream but then decided to keep it simple. For the sweetener, I recommend maple syrup (or another liquid sweetener). I prefer liquid sweeteners because they dissolve easily even in cold ingredients. 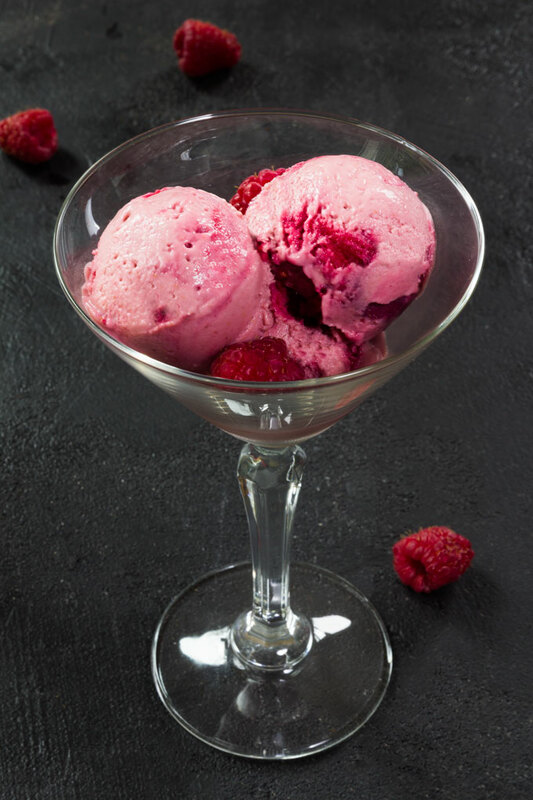 The primary purposes for using a sweetener in ice cream are: to provide sweetness and enhance flavor, to develop smooth and creamy texture, and to make ice cream softer and easier to scoop. How? In general, increasing the sweetener level increases creaminess as a result of the reduction in the size of ice crystals. Smooth and creamy ice cream requires the majority of ice crystals to be small. If many crystals are large, the ice cream will be perceived as being coarse or icy. So sugar in general (be it fructose, glucose, sucrose) is really important. Yes, I do own an ice cream machine and absolutely love it. If you love ice cream, I would highly recommend getting one. The benefit of using an ice cream machine is that it freezes the ice cream mixture while churning it to aerate the mixture and keep the ice crystals small (less than 50 μm). The result is smooth, creamy, and fluffy ice cream every single time. So if you have an ice cream machine, use it! If you don’t, you can make ice cream even without an ice cream machine. Freezing anything from liquid-to-solid means you’re creating hard ice crystals (= icy ice cream). So as your ice cream mixture freezes, you want to break up those ice crystals as much as possible. I would recommend pouring your ice cream into a shallow pan, put it in the freezer, and keep checking on it every 30 minutes. As it starts to freeze near the edges, remove it from the freezer and stir it vigorously with a spatula, whisk, or a hand mixer (a hand mixer will give you best results). Really beat it up and break up any frozen sections. Return to freezer. Keep checking periodically and stirring (by hand or with the electric mixer) while the ice cream freezes until completely frozen. It will likely take a few hours to be ready. Ice cream is one of the worlds' favorite comfort foods. It just seems to make everything better, don't you agree? This vegan berry ice cream is smooth, rich, creamy, and fluffy. It's also scoop-able and so easy to make. Place the ice cream maker freezer container in the freezer 24 hours prior to making the ice cream. Blend all the ice cream ingredients in a high-speed blender into a smooth consistency. Pour the strawberry ice cream into an ice cream machine and let it churn according to the manufacturer's instructions (the churning should take about 20 minutes). If you don't own an ice cream machine but still want to make this recipe, I would recommend pouring the ice cream mixture into a shallow pan, put it in the freezer, and keep checking on it every 20-30 minutes. As the ice cream starts to freeze near the edges, remove it from the freezer and stir it vigorously with a spatula, whisk, or a hand mixer (a hand mixer will give you best results). Really beat it up and break up any frozen sections. Return to freezer. Keep checking periodically and stirring (by hand or with the electric mixer) while the ice cream freezes until it reaches a soft-serve consistency. Blend the raspberries with maple syrup into a smooth consistency. Pour half of the churned strawberry ice cream base into a loaf pan (or a freezer-safe container, top with the raspberry puree and swirl the two mixtures together, not stirring too much. Then pour in the other half of the ice cream, top it with the remaining raspberry puree, and swirl again. Place plastic wrap, parchment or wax paper directly on top of the ice cream, cover and freeze for 1 hour for soft-serve consistency. For firmer ice cream, freeze for a few hours. (The time will depend on how firm you like your ice cream and how deep/shallow your ice cream container is - anywhere from 2-6 hours). 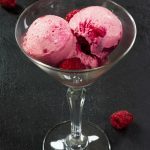 If you aren't using an ice cream machine, once the ice cream base reaches a soft-serve consistency, pour the raspberry puree over the ice cream and gently swirl the two mixtures together. Return to freezer and periodically stir (beat) the ice cream until completely frozen. It will likely take a few hours (from start to finish) to be ready. Store leftover ice cream in an airtight container in the freezer for 1-2 weeks. *Soak the cashews in water for at least 8 hours (or overnight) so they soften up and are easy to blend. To quick-soak cashews, pour boiling hot water over the cashews and soak for 1 hour uncovered. When the cashews are done soaking, drain the water and rinse the cashews thoroughly. (Note: if you do the quick soak, the ice cream will no longer be raw). **Prep time does not include soaking the cashews (8 hours). Love your website! Can’t wait to try your recipes. Hi Maria – so good to hear from you! I just uploaded a video for vegan (and paleo) cheese that is made from blanched almonds (no cashews). Will that work for you? Also, thank you for your kind words. 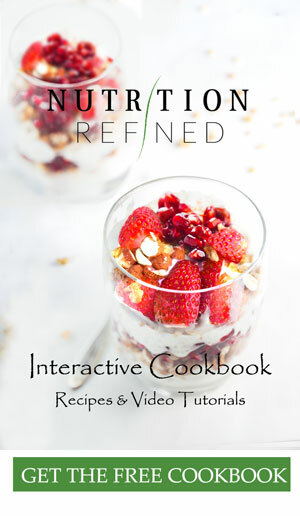 I am so happy you’re enjoying the videos/recipes! It’s always very encouraging to read comments like this so thank you! Oh and lasagna is in the works – I have gotten a few requests for lasagna video so now I just have to find some time to film it, lol. But it’s coming! Thank you for sharing. Always look forward to your videos. How many grams of strawberries is 5 cups? The ice cream looks great and I’m hoping to try it out!! Just don’t want to get the measurements wrong fan from Singapore.. I haven’t tried any of your recipes yet. I just discovered your YouTube channel today. Videos are very easy to follow and makes you want to run to kitchen to try recipes. I am wondering if the ice cream setting on the vita mix may be used in place of an ice cream machine?